When individuals suffer a spinal cord injury, paralysis is only a part of the major impact on quality of life. Often they also lose bladder control, which frequently causes infections that can lead to kidney damage. To address this problem, scientists used their groundbreaking spinal stimulation technology to enable spinal cord- injured rats to empty their bladders more fully and in a timelier manner. The promising results achieved in rats represent a significant step towards deployment of this novel approach in humans with paraplegia. In the earlier groundbreaking work, V. Reggie Edgerton, Ph.D., at the University of California at Los Angeles and colleagues from the University of Louisville, used the electrical stimulation technology to enable four patients with paraplegia to voluntarily stand for short periods of time, and flex their toes, ankles, and knees1. The current work is based on observations from this earlier study that other impairments in the four patients began to improve, such as blood pressure control, body temperature regulation, bladder control, and sexual function. 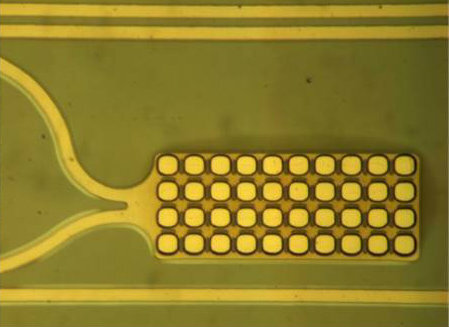 Close-up of the half-inch long multimicroelectrode array showing detailed circuitry leading to each individual electrode. The array is used to stimulate the spinal cord to enable locomotor and bladder function after paralysis. Source: Parag N. Gad, University of California, Los Angeles. In the current study, researchers set out to identify specific stimulation protocols that allowed the rats to control bladder function, with the aim of eventually making this technology available in humans. The study was funded in part by the National Institute of Biomedical Imaging and Bioengineering, the National Institute of Neurological Disorders and Stroke, and the Christopher and Dana Reeve Foundation. The results were reported in the online journal PLos ONE2. In both rat and human studies, the basic protocol developed by the research group involves implantation of an electrical epidural stimulator into the spine, which allows the researchers to regulate the electrical stimulation. The amount of stimulation, known as electrical enabling motor control (eEmc), can thus be modulated in order to determine the optimal level and duration that will achieve the desired outcome, such as voluntary control of leg movement or bladder control. In addition, in humans who have suffered a spinal cord injury and in rats with experimental spinal transections, a harness is used to suspend the participant, which enables him to voluntarily attempt a stepping motion on a treadmill while the implanted electrical stimulator is turned on. The harness setup allows subjects to “train,” or learn to move their legs in conjunction with the electric stimulation of the spine. The combination of motor training and electrical stimulation has proven to be effective for restoring some function to limbs and organs previously thought to be permanently immobilized due to the SCI. Detail of a single electrode of a multielectrode array. Source: Parag N. Gad, University of California, Los Angeles. In the current study — specifically aimed to determine whether eEmc might be used to regain control of bladder function — the UCLA group studied 10 SCI rats that were trained daily for six weeks with eEmc stimulation of the spinal cord, and five rats that were untrained. The trained rats were induced to empty their bladders while stepping on a treadmill and receiving eEmc stimulation. The untrained rats had minimal to no ability to empty their bladders upon eEmc stimulation. This finding suggests that the bladder response was enhanced by the additional sensory input to the spinal circuitry generated by treadmill training. In a second test, trained SCI rats were suspended in a harness, which allows the lower limbs to touch the ground. Saline solution was infused into the bladders of the rats using a catheter, and different levels of eEmc were applied to determine the amount of stimulation that optimized spontaneous emptying of the bladder. The most effective voiding was observed using a relatively low level of stimulation, with 90-95% of the volume of saline voided within 90 seconds. The work succeeded in identifying specific spinal cord stimulation conditions that cause the bladder to empty within seconds. The results pave the way for potentially developing this technology for use by individuals with SCI to regain substantial control of bladder function, which is one of the highest priority health concerns of the approximately 1.3 million Americans with SCI. This research was supported by the National Institute of Biomedical Imaging and Bioengineering (NIBIB) R01EB007615, the National Institute of Neurological Disorders and Stroke (NINDS) R01NS062009, the Christopher & Dana Reeve Foundation, the Walkabout Foundation, the Presidium of RAN, and the Russian Foundation of Basic Research Grants. 1.Claudia A. Angeli, V. Reggie Edgerton, Yury P. Gerasimenko, and Susan J. Harkema. Altering spinal cord excitability enables voluntary movements after chronic complete paralysis in humans. Brain. (2014) 137 (5): 1394-1409 first published online April 8, 2014 doi:10.1093/brain/awu038. PMID: 24713270.